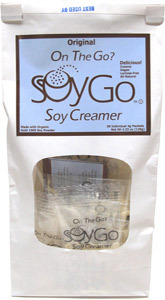 Whole Soy Vanilla- Good lord this is good yogurt. Ac, I didn't notice any reviews for MimicCreme. I still have sheese and teese in the fridge...I'm turned off by it for some reason! Tasty. It's got a pretty light coffee flavor, and it actually tastes almost more like chocolate to me. Can't complain! The DHA added didn't seem to affect the flavor. -I decided to try this for something different, and the appearance was immediately off-putting (I forgot our first rice milk experience...). It's so thin! Plus, it just looks weird...thin, and like transparent, but yellowish. The flavor isn't THAT bad..but I think that's just because I got the vanilla. I won't get it again. I had the vanilla version and it was "just ok". I thought it was too watery and the coconut flavor was kinda weird with the vanilla -- it was overpowering instead of complimentary. Overall, I was disappointed and it's not worth the $4.59 I have to pay at Whole Foods. It might be interesting to use for making ice cream but I won't be drinking it plain! Those dr cow tree nut cheeses look good, but expensive. Someone (fb) should try them! So Delicious Coconut Milk Beverage Unsweetened - totally neutral taste, i couldnt taste any coconut at all which was good for me since im not a fan of coconut. it only has 50 calories a cup, but 5 gms of fat and only 1 gm of protein. i didnt it notice it thicken very well when i added apple cider vinegar to it to make 'buttermilk' even though i added a bit extra acv, although the recipe turned out fine anyway. it is also the purest white ive ever seen in a non-dairy milk, so maybe if you're trying to switch your family from dairy milk this would be visually pleasing to them. it also isnt as thin as unsweetened soymilks i've used. Now this stuff is interesting. I want to say it's mild and at the same time I want to say it's strong... Let's put it this way: it's cheesey, but it's not sour like some sharp cheeses. It's pleasant (I would definitely say it's not one of those "acquired taste" or love/hate things, like nutritional yeast seems to be). At first I thought it was kind of boring, but after savoring it, it's got a sort of a "complex" taste I guess you could say (like some cheese!). I'm glad I tried it, and it's too bad it's so expensive. However, it lasted me longer than I thought it would. Also, I would recommend just eating it straight, without crackers/bread/etc, because I think those things take over the flavor (hence me calling it mild). I want to try the other varieties now! These are small (think a quarter cup measure plus a little), so if you order it over the internet or something, just keep in mind you're treating yourself to a $7 delicacy. Yuck! It had a weird bitter taste, almost chemically. Not sure if maybe it was the mint flavoring or the agave, which I've never tried before. I will not get this again. Sorry if someone already reviewed it, I didn't read back through the whole thread. eta: Anyway, that's a whole new brand for the review! eta2: Oh! I just realized it's ice cream, so I'll move it to the ice cream review thread. I posted this on another Teese thread on VegWeb ... and was alerted to this compilation of dairy alternatives. So here's my post again. I had Teese vegan cheese for the first time when I ordered pizza from Purgatory Pizza in Los Angeles. www.eatpurgatorypizza.com. While it doesn't have the same stringy, melty properties of dairy mozzarella cheese on pizza, it still tasted very, very good. Teese (www.teesecheese.com) melts better than the other vegan cheeses I have tried. Yes, it actually melted and didn't just look like soft white plastic blanketing my triangle of pizza. Teese also didn't have a weird aftertaste and is way better than the non-dairy cheese they use to make the vegan pizzas at Whole Foods. Having tried Teese, I think I actually might buy it now buy it and to try it on a panini or pizza at home. Has anyone the Teese cheddar flavor? Now I'm looking at the possibilities of the grilled cheese sandwiches I used to love. Thanks, Saskia, and thanks to Caroleena for pointing you in this direction! I was kind of disappointed by the Teese cheddar, but I really love Tofutti American for grilled cheeze. bought the 6 pack with blueberry, vanilla & strawberry. so far have only had strawberry. This stuff is quite good, nice flavour & no fruit chunks! (I hate yogurt with fruit chunks...) It's also local(!) to me, made in a city about half an hour from here. woo.